Spring is traditionally the season that gardener friends and neighbors share plants. So when we noticed in late May that one of the 13 corpse flowers in the production greenhouse at the Chicago Botanic Garden was showing signs of sending up an inflorescence, we knew it was time to share. We bid a fond farewell to titan arum no. 5 (now dubbed “Persephone”) on May 31, 2016. The titan traveled by truck to its new home at the Garfield Park Conservatory. Wanting to spread the titan bounty and to make this amazing plant accessible to Chicagoans from all parts of the city, the Garden turned to our friends at the Garfield Park Conservatory. Titan arums hail from the rainforests of Sumatra, and therefore need the high humidity and controlled warmth of a greenhouse. (Check: the Conservatory’s Jens Jensen-designed greenhouses include an Aroid House with lagoon.) The plants are notoriously slow to reach the flowering stage and unpredictable when they do—careful horticultural monitoring is a must. (Check: we heart horticulturists.) And the Conservatory is located mere steps from Garfield Park’s beautifully renovated Green Line “L” stop, the city’s most central and accessible train line (super check). Traveling in the city? 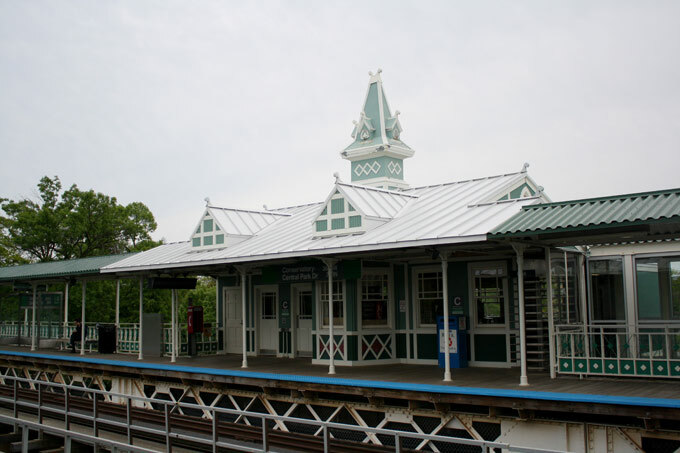 Take the Green Line directly to the restored Conservatory–Central Park Drive “L” station. For the Garden’s horticulture team, it has been a labor of love to raise “titan no. 5” to this stage. Grown from seed sent in 2008 by the University of California Botanical Garden at Berkeley, the plant had developed the largest known corm in the Garden’s collection. When it was repotted in December 2015, the corm weighed in at 48.2 pounds and measured 16 inches wide and 12 inches tall. Through careful propagation and much TLC, the horticulture staff had coaxed this corpse flower toward opening in just eight years—a fairly short time frame in the life cycle of a titan. 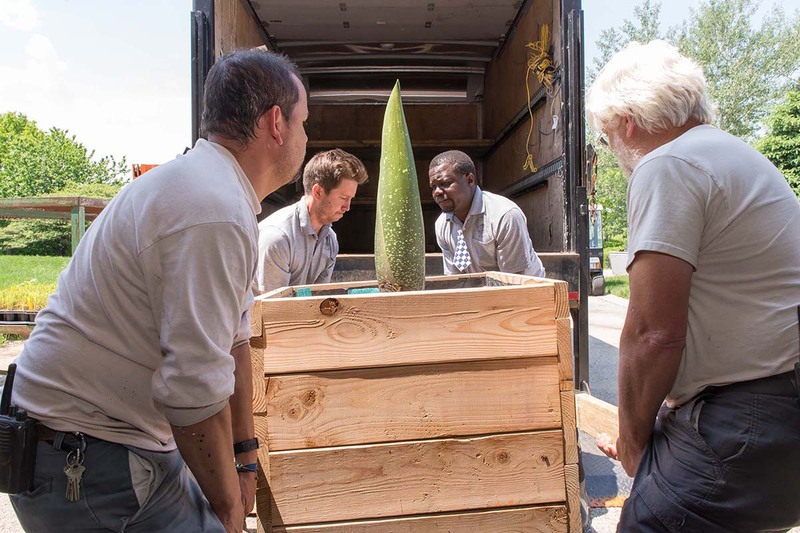 Mary Eysenbach, director of conservatories at the Chicago Park District, and her team at the Conservatory were thrilled to accept the gift of a titan arum, especially one nearing its first bloom. Dubbed “Persephone,” the plant was installed in the Aroid House, where it has been happily growing…and growing…among the Chihuly glass sculptures, reaching 69 inches in height by Thursday, June 16. 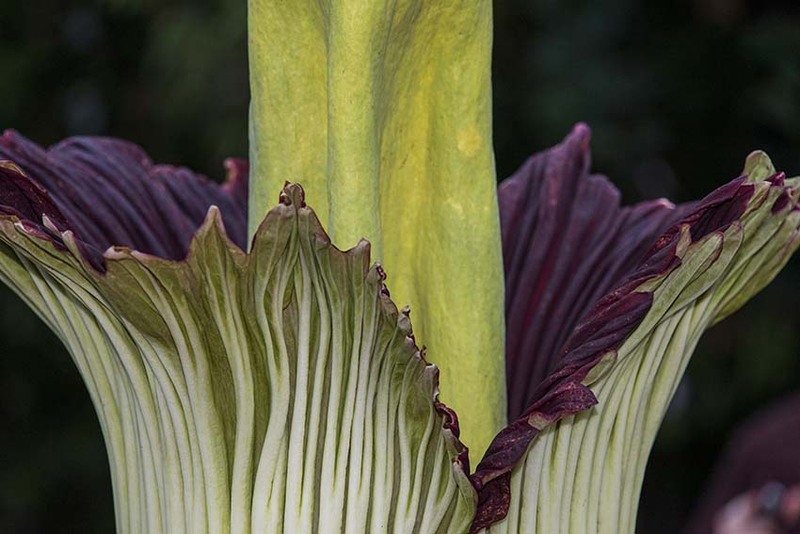 A titan arum’s inflorescence opens for a short time—just a day or two—and emits a powerfully stinky smell for the first few hours, as the female flowers inside put out the call for pollinators. If you saw Spike or Alice or Sprout at the Chicago Botanic Garden—or heard about “that stinky flower” through the news or social media—you know what a rare, amazing, sensational phenomenon a corpse flower can be. Increasingly rare in the wild, a flowering titan is a sight to behold, and a wonderful way to learn more about the astounding lives of the world’s plants. We’re proud to share a titan arum with the Garfield Park Conservatory, and encourage everyone to visit, watch, and smell as its inflorescence opens. Want to see Persephone in person? Take the Green Line directly to Conservatory–Central Park Drive. Follow the titan’s progress @gpconservatory ‪#‎GPCPersephone‬.